Midge Thomas drives down Silverbell Road three to four times a week, adding she see's someone jaywalk in front of the hospital entrance every single time. 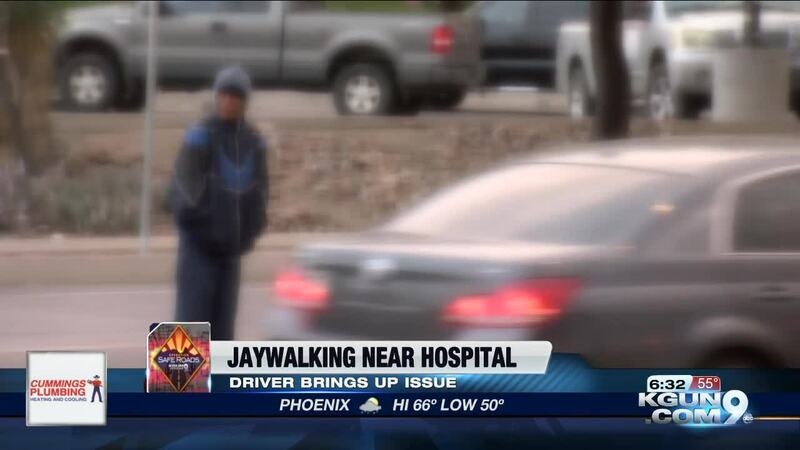 TUCSON, Ariz. - Midge Thomas drives down Silverbell Road three to four times a week, adding she sees someone jaywalk in front of the hospital entrance every single time. Thomas told KGUN9 she attributes part of the problem to the two bus stops near the entrance of the hospital. She said many times she see's people get off the bus and instead of walking to the crosswalk at the intersection of Silverbell and St. Mary's roads, they'll simply try their luck at jaywalking across. "There is the pedestrians that are trying to cross from this bus stop to the hospital or vice versa coming back on this side," Thomas said. Thomas added the problem has gotten so bad there have been times when she has had to quickly hit her brakes to avoid hitting someone. "It just seems to be escalating," said Thomas. However, the problem has not gone unnoticed. The Tucson Department of Transportation said they've reached out to Sun Tran to ask they consider moving both bus stops closer to the intersection in order to entice pedestrians to cross at the crosswalk. KGUN9 reached out to Sun Tran who's spokesperson said they got the message from TDOT, but have yet to send someone over to take a closer look at the area. "We're going to have to go out there to the site, really analyze the situation well to make sure we're not compounding the problem," said Paul Richter with Sun Tran. Richter added the process of getting a bus stop moved is one that takes lots of inspection but can be done quickly if it makes sense. He said that if Sun Tran inspectors decide moving the bus stops is possible, the next step would be to send the recommendation to engineers who are then in charge of approving the change. Richter said they have no timeline as to when inspectors plan on going to the area and do not know when they will have an answer. Meanwhile, Midge Thomas said she hopes something is done about what she says is a growing problem. "I just feel that this section is not a safe road," Thomas said.